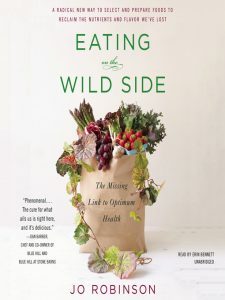 The Transition Marquette County Reading Group will meet to discuss the book Eating on the Wild Side by Jo Robinson, at 7pm on Thursday, Feb 8, in the Conference Room at Peter White Public Library. Robinson, a health writer and food activist, begins the book with the question “Where does our food come from?”. Her answer is not “the grocery store” or “the farmers’ market” or even “the farm – local or industrial.” Our foods come from plants that were wild 10,000 years ago, and have been “tamed” and altered over the years, sometimes by serendipitous mutation, sometimes by careful plant breeding at human hands. Again and again we have selected for sweetness, size, ease of preparation, appearance, shelf-life, and transportability. Unfortunately, in most of these changes the nutritional values of the plants have decreased until today they are far less nutritious than the food which kept our ancestors strong and healthy. For each fruit and vegetable, Robinson shows how to choose the most nutritious variety in the supermarket, at the farmers’ market, and for planting in our gardens. (One general rule is to choose the deepest colors.) She goes on to outline the best way to store each item, and even how to prepare them to get the most vitamins, minerals, and antioxidents. For example, waiting 10 minutes after crushing a garlic before heating it in the pan increases its nutritional value. Cooking carrots whole before slicing them is better than slicing and then cooking. She closes each section with a recipe or two designed to get the most out of each ingredient. Anyone is welcome to join the conversation. It would help to have at least started to read the book, but because of the special subject matter, a list of the “tips” will be available. For more information, call Charlie at 226-3314 or email mqtchaz@gmail.com. This entry was posted in Uncategorized on 1 February 2018 by Charlie West.